Companies such as Mytee Products sell many truck tarps to flatbed and dump truck drivers. Tarps are tools of the trade for protecting loads and meeting the regulations of the various states. We carry all sorts of products ranging from standard steel tarps to the largest and toughest lumber tarps. Recently, we have noticed a trend among truckers buying more roll tarps. These tarps are being used with different motorized rolling systems to make life a lot easier for the American trucker. A roll tarp differs from standard steel and lumber tarps in how it is applied. Rather than being manually deployed or lowered onto a load using a tarping machine, the roll tarp is connected to a mechanized frame that rolls and unrolls the tarp with either an electric motor or a manual crank. Deploying the tarp results in the system unrolling it down its length; the retraction process works just the opposite. Roll tarps have traditionally been used on dump trucks and grain trailers where it is nearly impossible to safely use any other kind. However, the industry is coming up with new and creative ways to use roll tarps on standard flatbed trailers as well. Drivers choosing to go this route are finding tarping a lot easier. Dump trucks and grain trailers usually carry loads that are not especially sensitive to environmental conditions. So why cover them with roll tarps? Because the states have laws in place requiring load securement in order to avoid anything flying off the truck or trailer and striking a car following behind. A dump truck carrying a load of gravel provides a good example. If that gravel load is exceptionally dry, the wind could pick up a few pieces of rock, which could then fly off the load and strike a car. Even a small rock can break a windshield at 60 mph. At the very least, such an incident would result in damage to the car that needs repair. In a worst-case scenario, the shock of the event could cause the car driver to lose control and drive off the road. This is why the states require dump truck and grain trailer loads be secure. Flatbed truckers can now use roll tarps by combining them with sidewall systems. Some of the most popular sidewall systems include a set of aluminum posts and panels that can be assembled around the perimeter of a flatbed trailer in mere minutes. Another popular system uses framing similar to what you might find on a covered wagon. In either case, once the sidewall system is in place the roll tarp can be deployed with little effort. •More likely to last longer due to better deployment. Another factor flatbed truck drivers have to consider is the time it takes them to deploy and remove a tarp. If using a standard tarp takes 30 minutes while using a roll tarp takes five, that’s an extra 50 minutes on each load the trucker isn’t spending on dealing with tarps. That time can be spent turning the wheels instead. Mytee Products offers a selection of roll parts for truckers. All of our tarps are made with the highest quality materials and are compatible with most standard roll systems. truck tarps you can choose from since they are available in different styles and sizes depending on the type of truck and the type of load being transported. 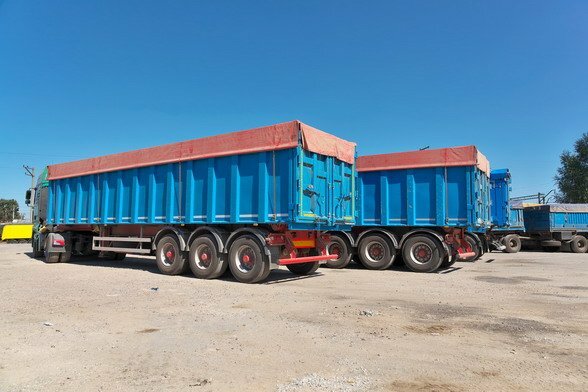 Some popular types of truck tarps are steel tarps, dump truck tarps, and trailer tarps which are all suitable for trucks that carry heavy merchandise and cargo. Since they are made of waterproof and highly durable material, most truck tarps are resistant to weather elements including snow, rain, hail, strong gusts of wind, and ultra violet rays. Steel tarps are suitable for truck roof covers especially in heavy goods vehicles, delivery services and other outdoor applications especially rugged applications. These are mainly recommended for hauling of asphalt especially when a waterproof cover is not necessary. On the other hand, dump truck tarps can be used for towing gravel, rock and sand. be protected against water especially because truck drivers are usually on the road even when it’s raining or snowing. truck tarps might not be suitable for other types of loads such as steel beams. Therefore, it is vital to consider the type of load you will be transporting. truck tarps are available fire resistant material. These truck tarps are recommended for various waste applications such as tree hauling for agricultural, mining and industrial applications, and other severe applications. Besides containing and securing loads, truck tarps can also be used as truck sides and roof covers. Therefore, drivers can rest assured that they will lose none of their cargo by simply taking the time to secure the loads they are transporting safely sing truck tarps. Flatbed truck tarps come in a wide variety of materials, sizes and even functionality. There is also no one-size fits all solution for these products. All this factors can make it extremely challenging for the uninitiated to effectively determine just what kind of tarp is ideal for their exact needs and preferences. To this end, this article has been specifically designed to briefly elaborate on some of the most common varieties of these items, and what use they are generally put through. These category of tarps are designed to effectually wrap around the front area of flatbed load. In essence, they are meant to protect cargo from accumulating soot, dirt and more importantly, the truck’s exhaust emissions while it is in transit. Smoke tarps can also be utilized to prevent the wind from generating the unnerving whistling sound that emanates from transporting cargos such as PVC and steel pipes. These tarps for the most part come with 10X12 dimensions. As would be expected there are also a number of accessories, which are necessary for properly using flatbed truck tarps in any kind of situation. This includes tie downs that secure these products in place. Let us now take a look at some of the most common of these accessories. Also known as Rubber Tarp Straps, these are handy tie downs that come in two major types, natural rubber and EPDM rubber.The first variety is designed to be utilized in areas that are characterized by cold climatic conditions. Natural rubber tie downs cannot crack, tear or get brittle even when exposed to freezing temperatures for protracted periods of time. On the other hand, EPDM rubber straps are meant for areas that experience hot weather. They can effortlessly withstand prolonged exposure to the scotching sunlight. This is a stretchy rope that comes with a heavy duty polyester fabric that encases a rubber core. A shock cord can be the best solution if you wish for a custom length tie down, which you can make use of by adding a bungee hook. Just like a shock cord, this type of tie down can be cut to the exact length you desire. It usually comes in two varieties, which are the hollow and solid core. The first type is designed for heavy-duty applications, while the second for lightweight applications. By now you would have come to realize that tarps are unique to the type of load a trucker carries and come with a variety of accessories to secure cargo and safely transport it.Please make sure you buy the right tarp for your cargo needs that is also durable and gives you the best value for your money.